Attention - There are broken links on my final project because I haven't figured out how MySQL works on my server. Originally they were not broken but this is a copy taken from the school's server. They no longer have my final project available as the space on the web was just for the duration of the class only. This project was very challenging. We had to develop a database driven website. The site had to deal with a foreign country's elections. 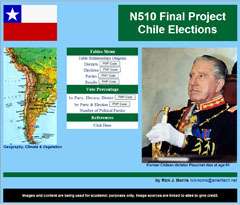 I chose the country Chile for my project.